Telltale's second episode of their choices and consequences adaptation of the video game series Borderlands amps up the volume, delivering an experience that meets the lofty expectations set by the excellent premiere. Rhys, Fiona, and their friends intend to follow the information they found to the top secret Gortys project, with the intention of getting their hands on enough money to get Rhys and Vaugn back on Hyperion and to get Fiona and Sasha off of the desolate planet Pandora for good. Of course, their uneasy partnership doesn't go as planned, as they have to contend with Hyperion and a pesky artificial intelligence that isn't known for being virtuous. The story line here is excellent, and the interaction between the characters really shines. There are some great character building moments here already. The actors all continue to deliver in spades. The writing is top notch, but the performances are what really drives the scenes home. The scenes between Rhys and the artificial intelligence are especially fun. The music also continues to be top notch, complimenting the voice work and the story well. The crew at Telltale really delivered with an excellent opening in the first episode, and it is matched, if not topped here. It's a really fun way to start the episodes. Hopefully it remains a Telltale mainstay from this point on. The game play also continues to be put to good use here. Whereas The Walking Dead Season Two and The Wolf Among Us devolved the game play a bit into mostly quick time events, Tales from the Borderlands seems to be putting their games back on the right track. The action still consists mostly of quick time events, but it comes with some additional game play elements that break from the monotony. The first episode introduced us to Rhys and his bionic echo eye, which is used in certain scenes to let Rhys inspect items and control electronics. The fun part of the echo eye is that it can be used as a surrogate look function any time Rhys is the playable character, providing some interesting information about the surroundings, as well as an opportunity for the writers to place some additional jokes. 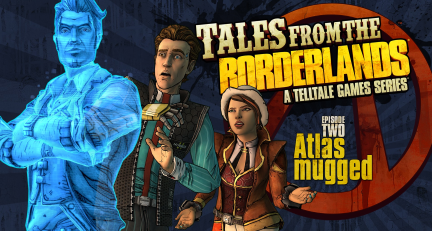 The second episode of Tales from the Borderlands is every bit as engaging as the first. It has a great story, interesting characters, great humor, excellent voice acting, and a soundtrack that sets the tone of the game quite well. In addition, the echo eye mechanic introduced in the first chapter is really put into use here, helping to break from the monotony of the action scenes framed by quick time events. Telltale is really setting up this series to be something special. If the rest of the episodes continue at this quality, Tales from the Borderlands might end up being one of the best choices and consequences game to come out from Telltale.